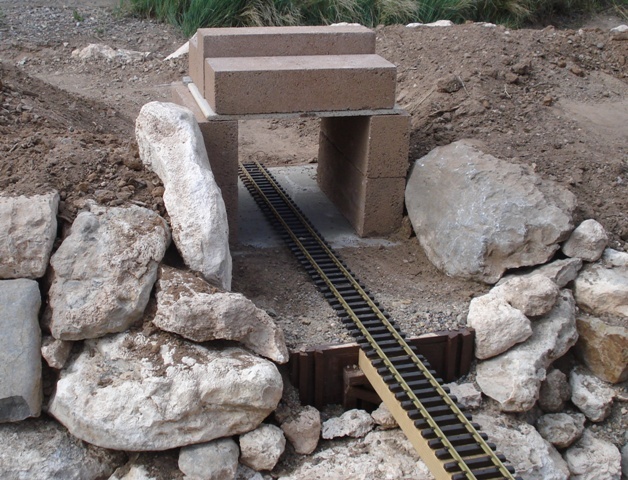 Model railroaders have long used tunnel to break up the birds-eye view of their layouts. They can divide areas to represent distance or separate scenes, even different time periods. 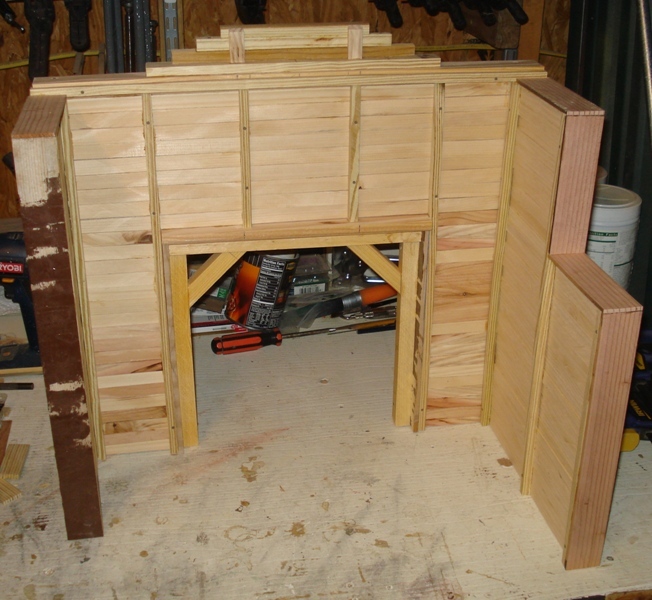 Easily built on small scale layouts from foam and plaster they pose a major construction project for garden railroads. Most of us have to create the mountain that requires the tunnel. Even then few of our mountains could actually justify more than a cut in real life. Some do build their mountains out of bricks and concrete but here on the Cibola we use the natural materials of rock and dirt. You might wonder if it is worth all the work. My aching back says “no” but my eyes say “yes”. With only four short tunnels on the layout at least I have not had to have the argument very often. 1. Tunnels are short. They are no longer than 24″. This discourages the local pack-rat and squirrel union from moving in and setting up shop. Snakes are equally uninterested in the shallow spaces. 2. 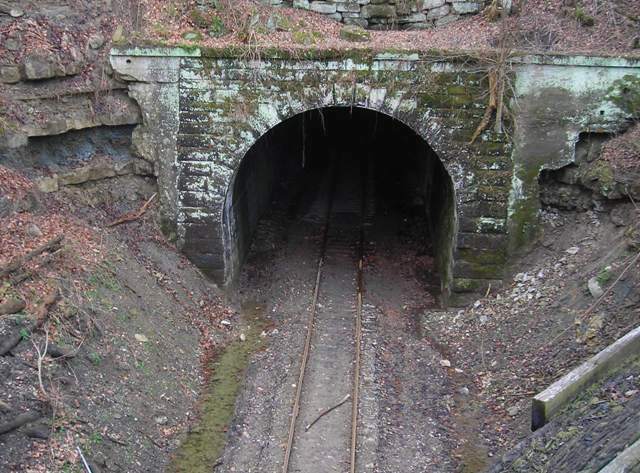 The tunnel has a liner to which the portal is attached. These are installed to promote good drainage and help extend the life of the portals and cribbing. 3. All tunnels have a floor. This is either a paving brick or a piece of hardybacker. Because all of my pests are burrowers I do not want them to be able to dig into the floor of the tunnel in an attempt to customize it to suit them. The floors also prevent the tunnel liner from sinking as it extends underneath the sidewalls and portals to spread the weight and provide support. 4. Clearance meets the same minimum distances as bridges. The exception is the mine loop as the equipment is very small compared to the other two loops. If you have ever tiled a shower stall you can build this portal with ease. Here is my inspiration. Of course these portals will need to be double track. To start I went to Home Depot looking for decorative tile sheets with small pieces that I could use for bricks or stones in 1/20.3 scale. I found plenty of each. Most are one foot square. The cost ranged from $10 – $16. For this project I chose dun colored tiles. 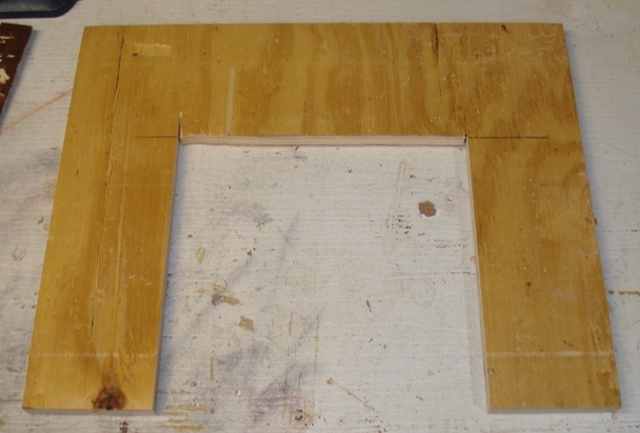 The two portals together required five pieces of crown header and five sheets of tile. The latter is glued to a nylon backer with what looked like hot glue. I peeled them off so I could save the gray pieces for another project. It also made attaching them to the portal support easier. 5 X Cappuccino Dome 3464799022 by Jeffery Court Inc.
1 X One inch square back-splash 0282577 by GBI Tile and Stone Inc.
4 X English Stone Empire 3464799616 by Jeffery Court Inc.
To begin with I marked and cut the portal support from Hardy-backer using a jig saw with a masonry blade. I used this on the insides of the opening and around the curves. 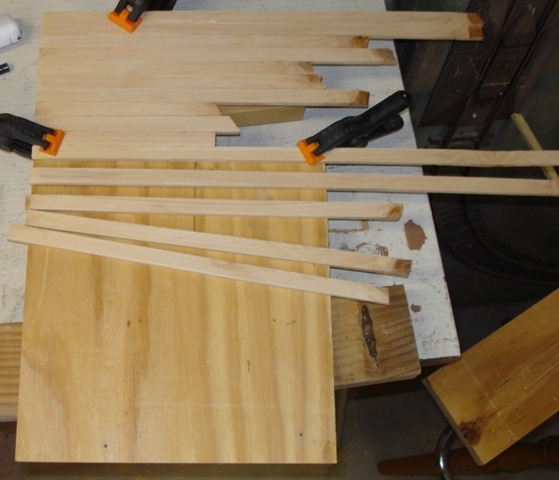 For straight lines I clamped the board to my work bench and snapped it on the pre-scored lines. After cutting I cleared off the dust and glued the domes at the top and the lining stones around the opening. I used Dap brand masonry cement in a caulking tube but any good weatherproof adhesive should work. The adhesive dried very quickly so I only coated about six inches at a time. The wooden paddle was used to spread it out. I eyeballed the placement of the stones to keep a 1/4″ gap. 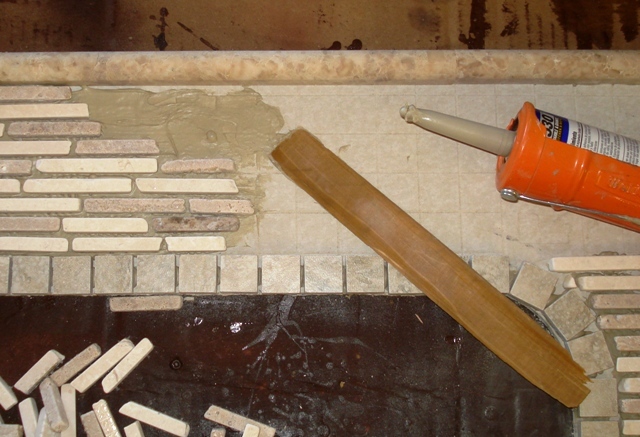 Cutting the stone to length was done with a pair of tile pliers. It breaks very easy. The domes were place in a vice and broken with a gentle tap from a hammer. They are fragile so put the break point right next to the vice jaws and tap right at the line. It took about an hour to place all of the stones then I left it to dry overnight. The next day I mixed up 4 cups of non-sanded grout. This is a tan color that complimented the stones. 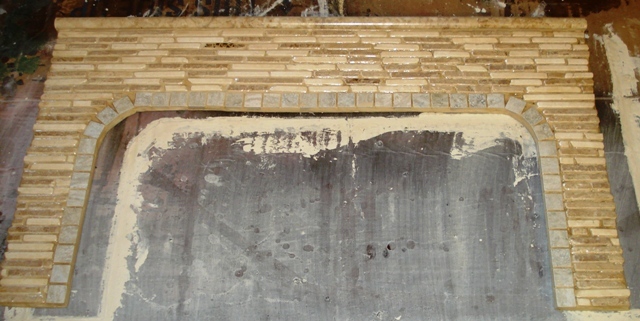 I poured the grout onto the tiles and smeared it around with a plastic putty knife working it into the gaps. 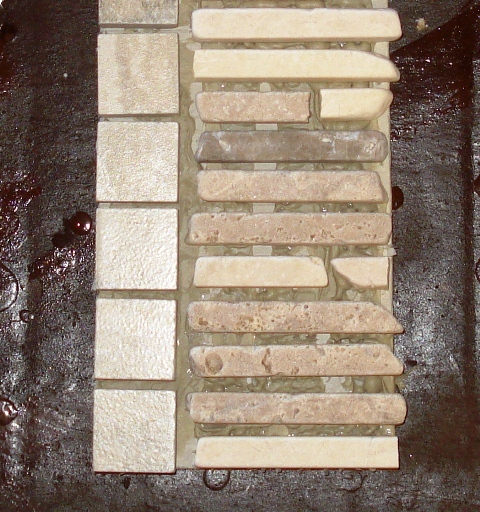 I spread from the ends to avoid capturing air bubbles in the grout. 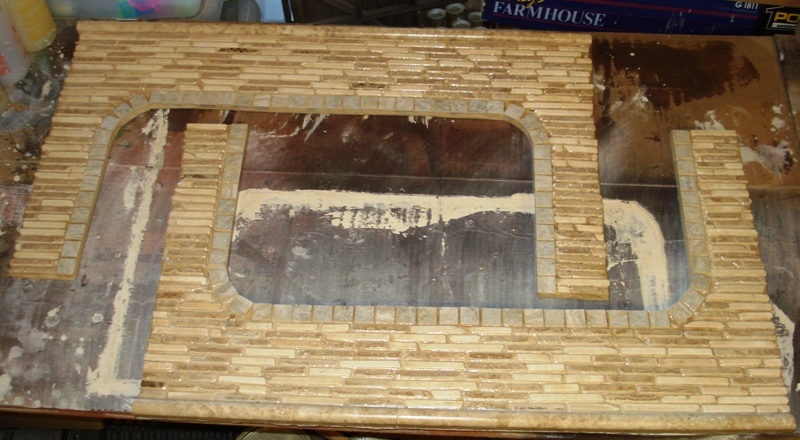 At the edges and around the inside of the opening I formed the grout over the Hardy-backer to hide it. After 30 minutes of drying I went back and gently wiped the surface with a wet sponge to remove the excess grout. This took a bit of effort as the sponge loaded quickly. I tried to keep it fairly dry so as not to weaken the grout with to much water. Again everything was left to dry overnight. The next morning I sanded the edges with a foam sanding block to smooth them out. I also used it to clean the haze off the tiles. The surface was wiped clean with a damp towel and then the entire thing was sealed with concrete sealer. I did the back first so that if it stuck to my work surface it would not mess up the tiles. I will give them a few days to dry and then hit them with a coat of matte finish enamel to knock that shine down. Here they are ready for installation. Installation details will be in The Year of Track article for July. Right now I am only planning one tunnel for the branch line. It is being constructed as part of the 2015 “Year of Track” project. After piling up huge amounts of rock and dirt I placed a 2′ X 2′ piece of cementatious board under the area where I wanted the tunnel. I originally considered making plywood liners as I did on the mine loop but changed to bricks due to the large amount of organic soil in this area. 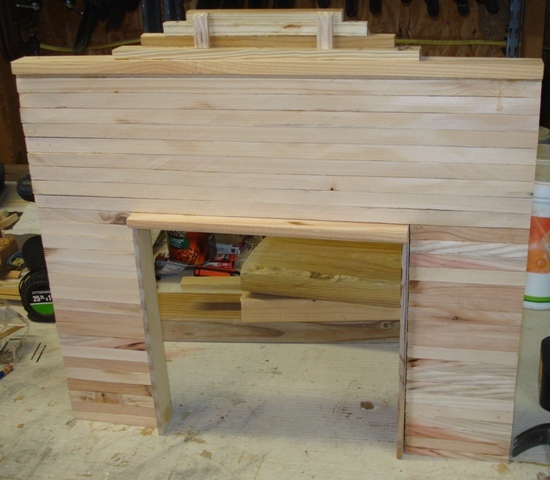 I am afraid it will trap and hold to much moisture for the plywood plus the tunnel has to support the overburden as I have no more of the large rocks I used before. Wall bricks were purchased and stacked as required. 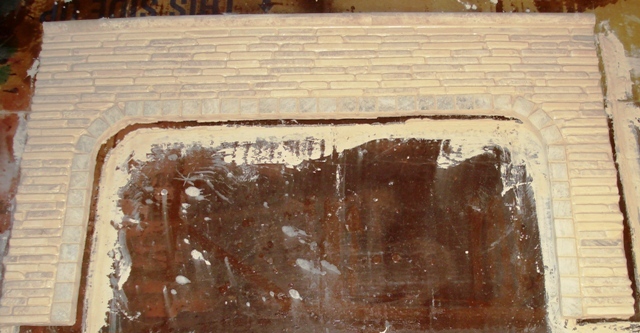 There is a second piece of cementatious board to help prevent sand and dirt from filtering through the tunnel roof and falling on the tracks. This may look like it went really fast but with having to line up the tunnel with both the ROW and the grade, along with some initial rock stacking it took over four hours of adjusting and fussing. The next part was worse, three days of portal construction. 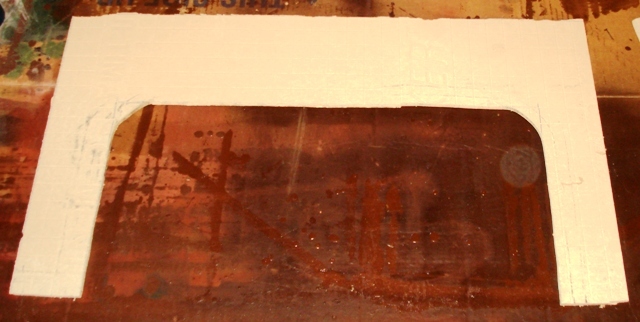 I began with pieces of 3/4″ plywood salvaged from a kitchen counter remodel two years ago. 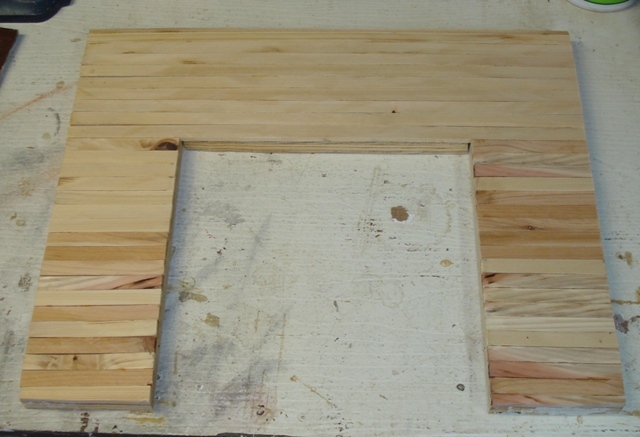 Cedar fence pickets were then sacrificed to the table saw god to make the cribbing. These were glued on with TB3. Headers and liners were added along with the upper retaining wall. Tunnel framing was fitted inside the portal mouth. 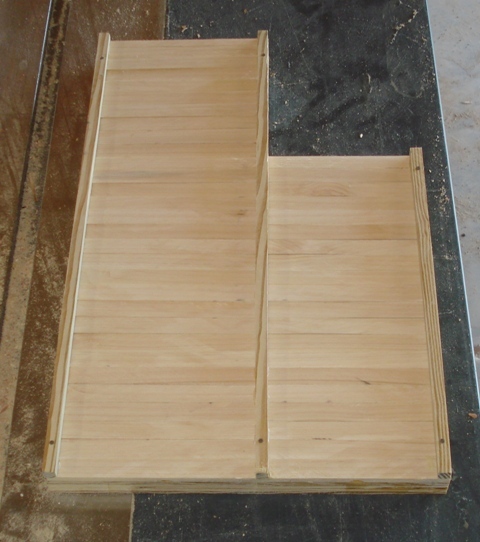 These parts are glued in with TB3 and secured with 1″ ribbed panel nails. 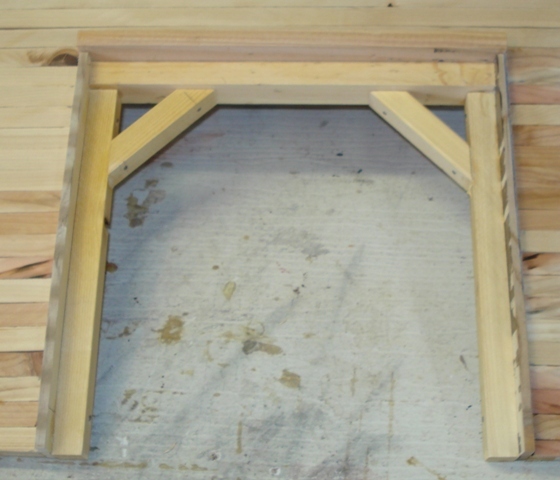 To finish 3/8″ frame posts are added for appearance. Again using TB3 and 1″ ribbed panel nails. 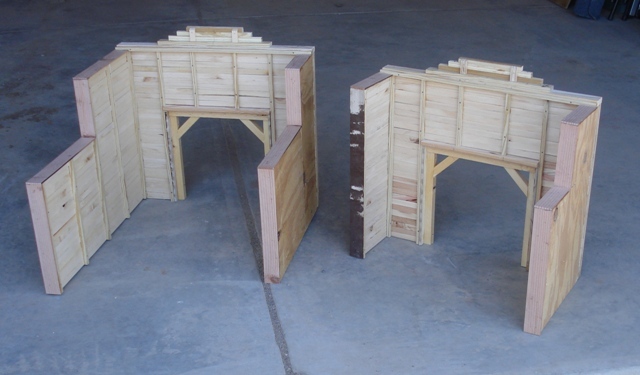 Wing walls are made in the same manner. They are in different shapes as required by the contour of the mountain around the tunnel mouth. 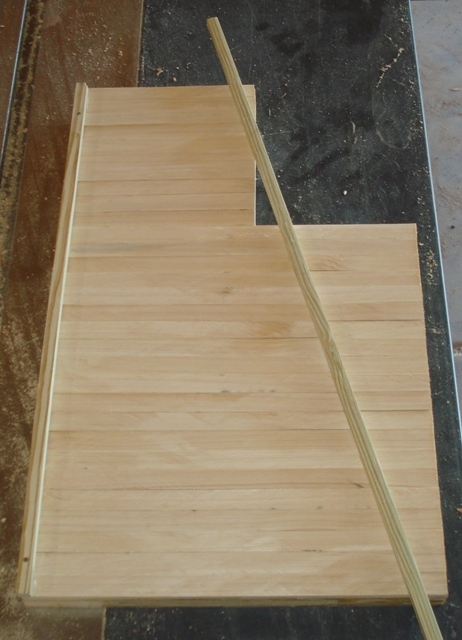 I did not want to have to measure and cut a hundred planks so I glued them on aligning only the left side. 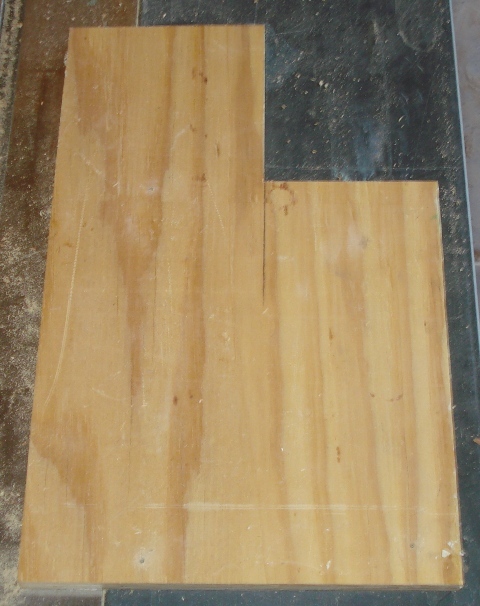 Squaring the ends of the cedar planks with the edges of all three sections was done using either the table saw or the band saw to cut them off even. 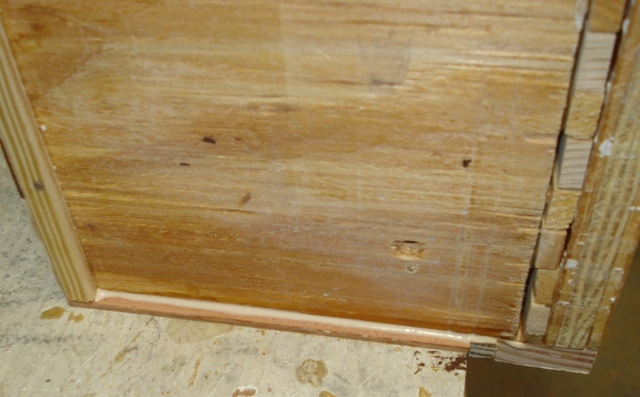 To keep water out and to hide the edge of the plywood I covered the edges with 2″ wide cedar planks. To keep these from curling I turned the portals upside down and ran a bead of glue along the bottom of the overhanging lip. 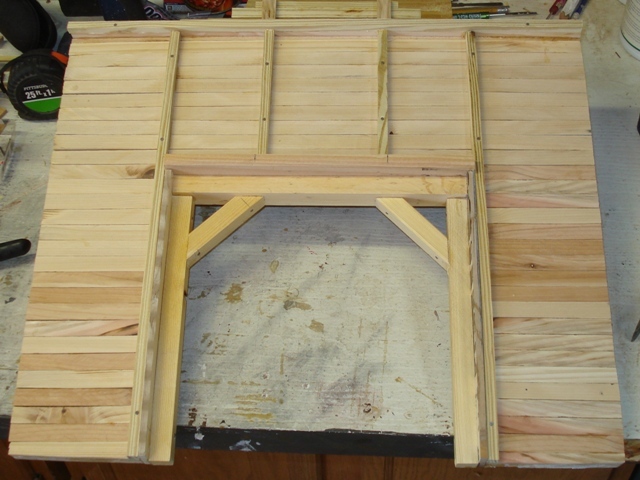 The wing walls were attached using 1 3/4″ ribbed panel nails. I think it would have been better to use wood screws. Something to keep in mind for the future. To finish I shot some pin nails to hold some of the smaller pieces on. Both portals will get a coat of Rustoleum brown on all sides before installation. 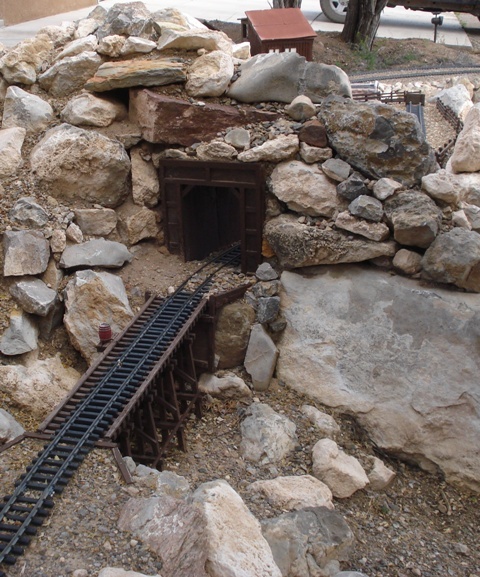 There are two tunnels on the mine loop. 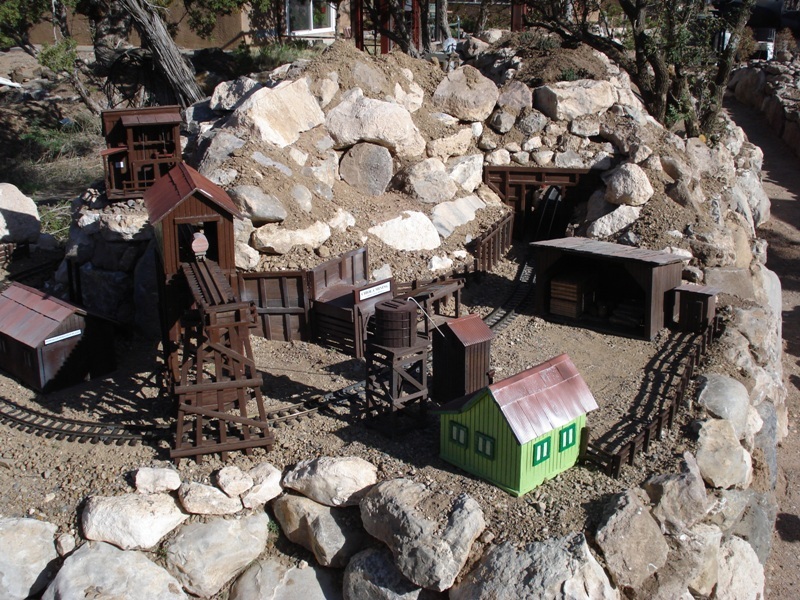 They were built to separate the view of the Carly-Jene #3 mine from the stamp mill and yard. They also impart a since of rugged mountainous terrain. 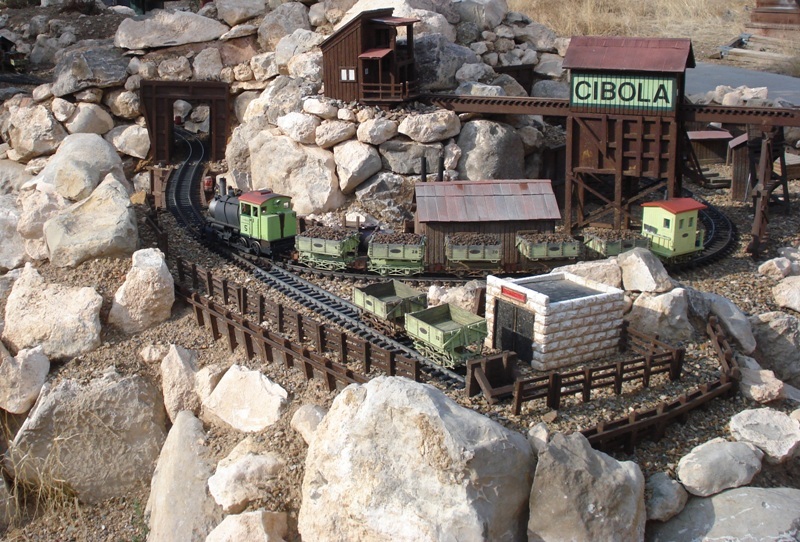 These were built in 2010 as the first part of the layout. 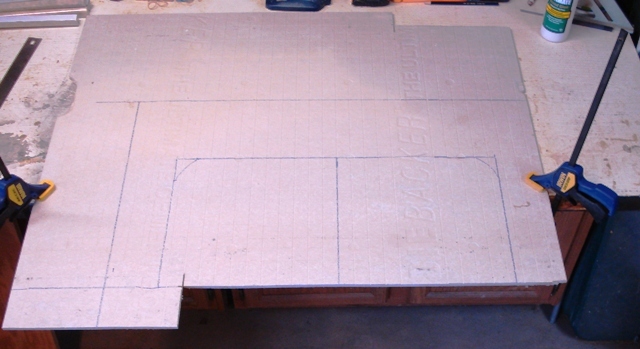 The liners are made from 3/4″ plywood with the portals attached. 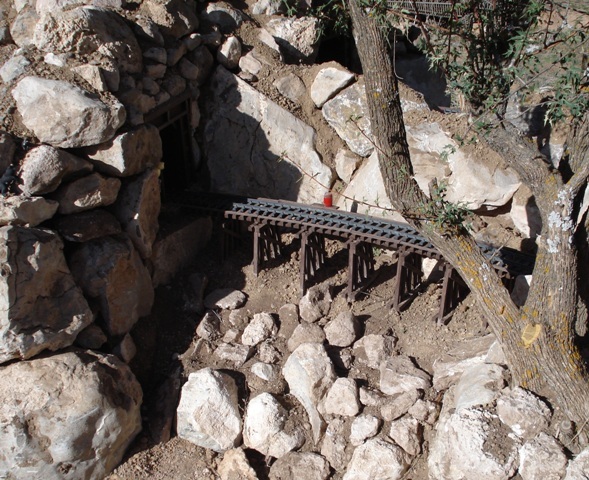 Rocks, gravel and crusher fines were added to close the mountain around the tunnel mouths. Neither tunnel liner supports the weight of the overburden. 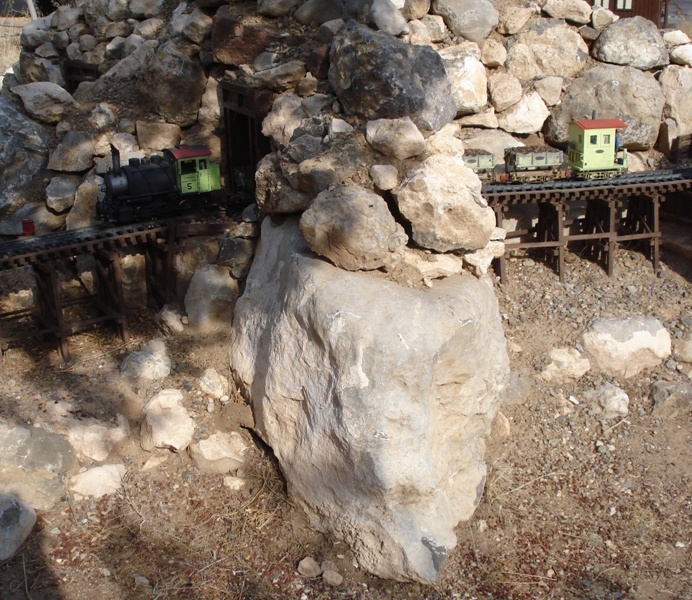 Large flat rocks were placed to span the liners. They rest on supporting rocks on each side. The void was then filled with expanding foam and then hidden by scree. Both tunnels are painted inside and out with Rustoleum oil based “barn” paint. The mine loop is an oblong peanut shape. Its location and design was dictated by the presence of several boulders that were already on the property. 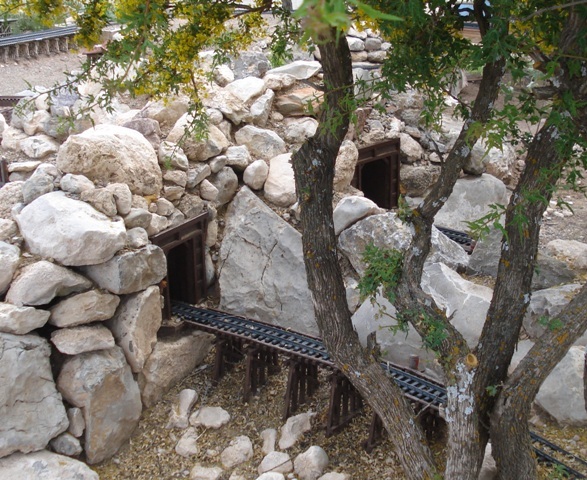 The tunnels are on opposites sides of the #3 mine scene separated by a spine of rocks. You can see in the pictures above that the mine train (#5) barely squeezes through. I have run a Bmann two truck shay and a climax through these. Roosters were required to make the tight curves. They are now approaching five years old with nothing more serious than some faded paint. This is a fast drying high drainage area so hopefully they will last a good long while.